One of the keys to successful commercial design is understanding your audience. If you find yourself working on a design whose target audience will be mostly women, you may need some ideas on how to make it more “feminine.” In commercial design, your concepts should draw the eye of the viewer and strengthen the delivery of a message. For female audiences, a feminine design is more appealing, more effective, and better suited for the purpose. So, what makes a design feminine? Can you really design something that is naturally attractive to the female eye? With the right fundamentals applied, anyone â€” even those of the more macho persuasion â€” can successfully design for a female audience. Keep in mind that preferences change between different cultures and age groups. For example, we tend to associate bright pinks and purples with very young women, while deeper shades of red and purple are usually chosen for adult women. As with any design, make sure that you have a clear understanding of your audience and keep that specific audience in mind throughout your designing process. 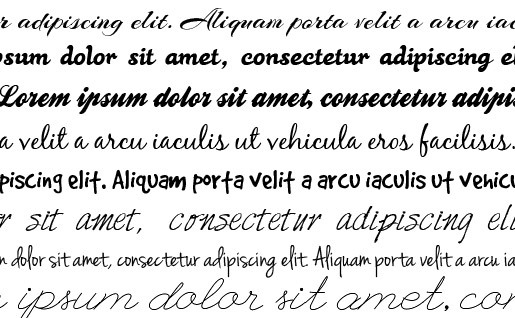 Scripted or handwritten fonts can lend a feminine touch to any design. Of course, use these fonts carefully. Not every design element should be adorned with scripts. Instead, focus on titles or headings, and leave the body text in easy-to-read fonts â€” typically a simple serif or sans-serif. Also, bear in mind that fonts you choose may not be immediately usable on the web. In the introduction, I mentioned color concepts for feminine designs. These concepts are based on numerous studies on color appeal. While the results of such studies vary, they do share several common conclusions: First, neutral tones like browns and grays are poor choices for feminine design. Second, both genders like various shades of blue. Third, greens tend to be preferred more by women. For a wonderful discussion of the breakdown of colors, check out this piece on Entrepreneur.com in which John Williams discusses what different colors say about a brand. Williams’ color associations should have an influence on your feminine design project. A few simple tips on color: limit your palette, stick with bright colors, keep the contrast high (for readability), and use softer tones since they are generally associated with more feminine concepts. Pastels tend to be a good place to start; they’re built right into the color swatches in Photoshop (Window -> Swatches, then in the fly-out menu select Pastel coated or uncoated). 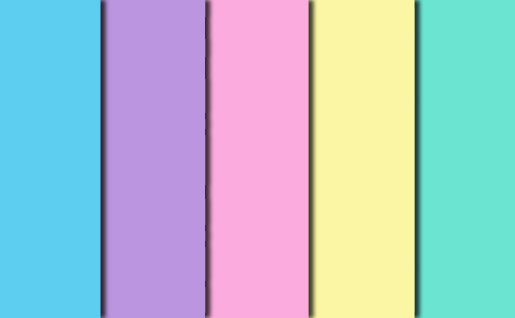 The above color scheme is from the pastel uncoated swatch set. Floral patterns are deeply connected to mother nature, a famously feminine idea across all cultures. An easy way to connect with this concept is to integrate gentle floral and curl elements into your designs. Floral Photoshop and Illustrator brushes make it an easy task to quickly integrate these elements. 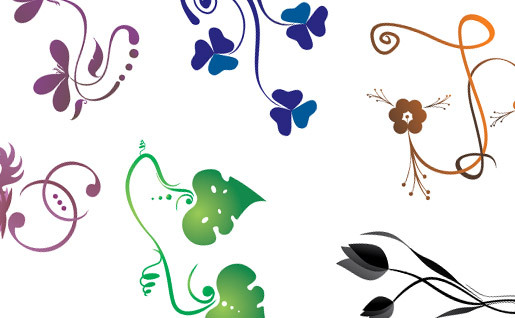 The above design was made using a flower vector set from Pink Mustache: Flower Vectors. 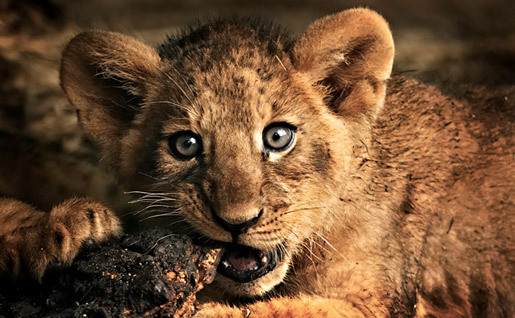 Am I being overly-clichÃ© to say that we girls love baby animals? I’m sure I’m not the only one with a reliable “warm fuzzy” reaction. If you can integrate babies of any kind into your designs for women in the mom or grandma category, you almost certainly should. For single women in the business world, however, the appeal of babies may be diminished. Photos of other successful career women would be more likely to attract this group. For businesswomen, find photos that show women in charge in the workplace or women who have a gorgeous guy (or two or three) fawning over them, both in the workplace and outside of the work environment. No matter what subject your photo incorporates, try to find graphics where the subject is looking into the camera. This creates an engaging experience for women especially. Female viewers are more likely to make an almost-emotional connection with the subject in the photo, and this connection will often be transferred to the brand hosting the advertisement. The copy on your designs may be the most important element for connecting with a female audience. Your graphics may draw attention, but if your tone is cold or disconnected, your audience will quickly disconnect with your design. We gals do not like to be put into a box. We are complicated creatures and quite unique (or at least we like to think of ourselves this way), so do not insult us with a design that we can tell was created by a man who just doesn’t understand us. As mentioned above, always study the demographics of your audience. And, especially if you are a dude, have a few women review the design and give you their opinions. You are much more likely to meet the interests of your female audience if you do your research and get some feedback before sending it to your client or for distribution. How do you approach designing for a female audience? What are some immediate visual cues you associate with this concept? Tara Hornor has a degree in English and has found her niche writing about marketing, advertising, branding, graphic design, and desktop publishing. She is a Senior Editor for Creative Content Experts, a company that specializes in guest blogging and building backlinks. In addition to her writing career, Tara also enjoys spending time with her husband and two children.